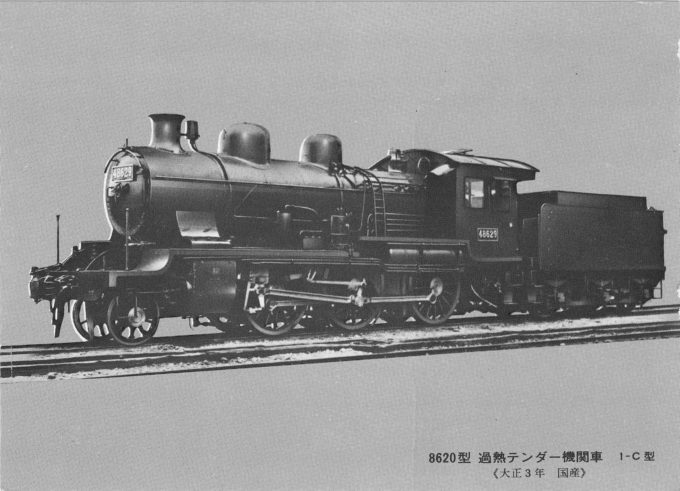 The Class 8620 was a type of 2-6-0 steam locomotive built in Japan from 1914 to 1929. Based on a German model, the Class 8620 became the first locomotives to be wholly designed and manufactured in Japan. A total of 672 Class 8620 locomotives were built. Postcard reprint published ca. 1960. “Locomotives ordered from the United States and Germany began arriving in Yokohama one after the other between June and July 1911. The Agency of Railways began immediately assembling the locomotives … [E]xact records were made of each part, and efforts were made to get ready to manufacture of the locomotives. In preparation for manufacturing a superheated steam locomotive, the Kawasaki Shipyard expanded its facilities, increased its workforce, and obtained a patent for a Schmidt-type superheated steam engine. “From 1911 to 1912, the Agency of Railways, working with private rolling-stock manufacturers, set about reverse engineering and meticulously copy the model locomotives at the parts level, and succeeded in creating a copy of a locomotive for large passenger trains. Thereafter, in 1914, it succeeded in developing a locomotive conforming to Japanese standards (Japan National Railway [sic] number 8620) that was modeled after a German-made locomotive but incorporated original design elements, and efforts to mass produce this locomotive were begun.